Imagine that the battery of your mobile phone is dead after spending a nice sunny day at the park. And of course, there isn’t any electric socket anywhere near. This difficulty soon might be a problem of the past. 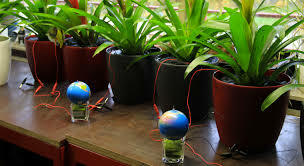 Dutch techno starter 'Plant-e' designs and develops products that use living plants to generate electricity. While renewable such as wind, solar, hydro and bio fuel may be leading the way in terms of sustainable energy uptake, there are still new developments being made in the field, in both big and small ways. The technology captures energy that already occurs in the natural processes of water-based plant life. The plants take in solar energy through photosynthesis, and waste products from the reaction are delivered into the waterlogged soil. There, micro-organisms break down the material and release electrons and protons that can be picked up by an anode and cathode to produce an electrical charge. Dutch scientists have developed a revolutionary system that could one day help isolated villages around the world steadily generate electricity from mundane water-logged plants such as rice growing in paddy fields. A system that could ultimately see lights shine in homes which can ill-afford hefty bills. The company was founded in 2009, as a spin-off from Wageningen University, by Marjolein Helder and David Strik. The technology enables the user to produce electricity from living plants at practically every site where plants can grow. It is based on natural processes and it is safe for both the plant, and the environment. Let’s hope this technology will soon become a common way to generate electricity. And it might also be an incentive motivation to plant more trees and greenery, so we could, not only provide ourselves with more electricity, but also create more oxygen and animal habitat. “The advantage of this system over wind or solar is that it also works at night and when there’s no wind,” said Marjolein Helder, co-founder of Plant-e told AFP. “If the system becomes good enough, it could provide electricity for isolated areas or even be installed in our cities and countryside to produce clean electricity,” she told AFP. The technology harnesses the excess organic matter produced by the plant during photosynthesis, which is expelled through the plants roots and consumed by micro-organisms. That consumption frees up electrons, which can then be harvested by placing carbon electrodes close to the roots to generate electricity. Getting power from plants is not new, “but here we don’t need to damage the plant, it’s a non-invasive system,” said Helder.